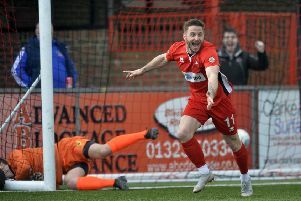 Three goals in ten first-half minutes eased Eastbourne Borough into the last 16 of the Parafix Sussex Senior Cup against Worthing United on Tuesday. It was never a rout against the Southern Counties Combination club – three levels below Borough – but the result was seldom in doubt as the home side did just what they needed. As well as progressing towards a trophy which should always be in Borough’s sights – with the grand day out at an Amex final in May – the Sports ticked a couple of other boxes. After recent lean spells, front men Elliott Romain and Darren Lok were both on target with excellent strikes. A sublime 45 minutes from Miguel Baptista gave supporters an exciting reminder of what the Portuguese playmaker has to offer. And centre-back Adam Watts, plagued by injuries over the past year, came successfully through a full game. Worthing United, ever so slightly awed by the occasion and surroundings, contained Borough in the early stages, keeping their shape sensibly. Striker Pat Rose even had the opening shot, a rising 20-yarder that did not trouble Lewis Carey. But at the other end Romain set himself with smart movement for a scorching low drive, just past the left post, and Nat Pinney burst through but was closed down by desperate defending. The breakthrough came on 25 minutes, Romain emphatically heading in a Sam Beale corner, and then this contest of unequals followed the script. Six minutes later Romain notched his second from a right-wing cross, just beating James Shaw’s brave flailing effort to save it. Baptista, meanwhile, had been parading his range of fine passing, and he combined well with Pinney to strike a low shot past Shaw into the bottom left corner from outside the area. Briefly, an avalanche looked possible and Romain, desperate for the hat-trick, blasted one great chance too high, before the half-time whistle brought United a breather and a cup of tea. Or perhaps it was a double-shot espresso, for a few minutes into the second half Worthing had their moment of glory. Sam Blundell forced his way to the by-line – actually with the aid of a foul to which indulgent referee John Pike turned a blind eye – and shot from a narrow angle. Carey’s save deflected into the path of a jubilant Rose, who scored from ten yards. But Worthing’s hopes of a cup shock vanished in the November mist. Darren Lok, on as a half-time substitute and full of fire, raced at the heart of the visitors’ defence and fired a torpedo of a shot low across the keeper for 4-1: a classic Lok goal. Then, with perhaps half an eye on Saturday’s visit of leaders Ebbsfleet, Borough sensibly saw the game out. There was a brief debut – including the pass of the match – from Academy midfielder Ryley Tate, and a couple of spectacular luck-plus-judgement saves by Shaw, but no further goals, and everyone went home happy. Borough: Carey; Watts, Khinda-John, Wilson; Stone, Bosma, Baptista (McCallum 45), Haysman, Beale; Pinney (Tate 65), Romain (Lok 45).